The library was carefully maintained at the Corbie monastery. Old books were kept in repair and supplementary literature was purchased, but an active scriptorium was no longer in existence. New manuscripts were ordered from local copyists, from Amiens and from the Parisian workshops (Delisle 1861, pp. 40 ff; Jones 1947, p. 201). Therefore, when it was decided to acquire a collection of music for the special needs of the confrérie Ste Barbe, it seems impossible that it should have been ordered from a local shop. Musical expertize of a particular type was required to select the repertory. It must be our best guess that the young Caulaincourt, when he at Easter 1502 set off for Paris to study for ten months, brought along a detailed set of instructions from abbot d’Ostrel for the music collection and a sum of money to cover the expenses. His journey started a few months after the start of the building of the new church. Caulaincourt’s Chronique does not tell us anything about his studies. The financing of his stay in Paris did not pose any problems, because in the same list of the abbot’s dispositions for the year 1501, where the monk’s participation in the banquets of the confraternities was settled, 200 livres yearly were granted to the maintenance of “our monks in Paris or study in other places” (Monachorum nostrorum Parisiis, vel alibi studentium; MSS Amiens 524, p. 336, and Paris 17757, f. 90v). And, as Caulaincourt mentions, he studied with and probably stayed with his cousin, the learned Jean Le Vasseur. In these Parisian circles it was certainly possible to find the looked-for expert with access to a wide-ranging repertory of monastic music. This person was the copyist we have dubbed Hand A, and he was surely also responsible for the selection of the funeral music and the sequences, which fills out the main part of the manuscript. Thirty sheets of good quality parchment in large format were used for the music manuscript, and its big musical notation makes it eminently legible at a distance for a group of singers. All the text below the music is written in variants of the gothic minuscule script or textura (littera textualis formata) of the type found in countless manuscripts from the scriptoriums of churches and monasteries. In textura script it is often difficult to discern individual characteristics of the hands that had participated in producing a manuscript. Every letter is so to say drawn separately, often with more than one stroke, according to patterns, which did not vary much in the many parts of Europe where the script was used. This makes the textura very different from cursive script, which often discloses the copyist’s personal characteristics in the flow of letters across the page. However, in Amiens 162 it is relatively simple to discern the two main copyists (hands A and B) – the two scribes’ conspicuously different methods of preparation for music copying are in this respect very helpful. It is also quite easy to recognize three hands as developments of the same copyist’s writing over time (Hands B, C and D). It seems obvious that the copying of the music manuscript started when the repertory was selected and ready. In order to get the work done in the short time available, the two main hands worked alongside each other, each on his part of the project, and we can imagine how they worked on the music manuscript. Hand A concentrated on the music for funerals and commemoration, for which he prepared 14 sheets of parchment (see further the description. He was a professional scribe of liturgical books with musical notation such as missals and antiphonaries, in which prose and music alternate. In such manuscripts it could be difficult to predict where precisely musical notation should take over from text and rubrics, and therefore the musical staves were only drawn when initials and rubrics were in place upon the pages. This was exactly his method of working. First he entered all the text and the initials in dark brown (black) ink leaving spaces open for the red initials and for letters in a contrasting colour. Then he drew the initials and after that the music staves in red ink with a rastrum, seven staves on each page, carefully matching the texts below (staff system 1). The last stages were to enter the music in brown ink and the emphasized capitals and the decorations of the black initials in yellow ink. His texts are entered in a clear and well-formed textura with the single letters closely spaced and strong contrasts between the heavy strokes and the hairlines and with acute-angled feet on all vertical strokes. His expertise in musical notation was probably restricted to the black notation of plainchant and the related simple polyphony; his custos are – as usual in chant manuscripts – formed as miniature puncta. He folded eight sheets into two fascicles (quaternions), which gave him sufficient space for four songs, and he left the front page of the first fascicle blank (ff. 2-17v). In the single two-part composition (ff. 13v-16) the tenor voice with the pre-existent tune is placed on the left hand pages, and the contra voice is on the right hand pages. In the three-part compositions the tenor is written across the openings at the bottom of the pages with the higher voices above it; the highest placed at the left. This disposition of the parts was traditional, known from countless motets from the 13th century onwards. In the songs with several stanzas the music and text for every single stanza is fully written out, each stanza occupying an opening. The fifth funeral piece was very long, ten stanzas, and he folded sheets in two fascicles in order to copy it, one of four sheets and one of two (ff. 18-29v). After filling out the ten openings in exactly the same way as in the preceding three-part songs, leaving the front page blank, he furnished the remaining pages with empty music staves drawn from side to side (ff. 18 and 28v-29v, staff system 2). We find some quite unusual features considering that the repertory consists of anonymous music in very simple notation: For three out of the five compositions the tunes are known from other sources (“Quando deus”, “Creator omnium” and “Juxta corpus”), the texts of three of the five are known in one or more contemporary or recent polyphonic settings (“Bone Ihesu”, “Lugentibus” and “Juxta corpus”). Among the five only one sets a text and tune from the older liturgical repertory (“Creator omnium”), which on the other hand has the most ‘modern’ setting, while we for the remaining four know the texts only from the late 15th century and in particular in slightly different versions from other monasteries in French speaking regions and Southern Germany (“Bone Ihesu” changes an original Franciscan text into one acceptable to Benedictines, “Juxta corpus” has a Dominican leaning, but has been changed into an Augustinian text in a MS from the monastery Grand-Saint-Bernard etc.). In his preface to the facsimile edition of the antiphoner from the cathedral of Worchester Dom André Mocquereau describes the Benedictine funeral ritual according to the rubrics in the antiphoner (13th century) supplemented with descriptions of ceremonies in the affiliated Benedictine monastery in Evesham (Mocquereau 1925, pp. 115-117): After the requiem mass a procession was formed, and with the cross bearer, bearers and acolytes with incense and holy water in front the monks went to the main altar and grouped around the catafalque where the deceased rested. From the choir steps the cantor and two monks intoned in “lamenting voice” (voce lacrimosa) the antiphon “Circumdederunt me gemitus mortis”, which the assembly answered with “Dolores inferni circumdererunt me”. This alternated singing was repeated trice. Then two brethren sang “Kyrie eleyson, Christe eleyson, Kyrie eleyson” and the assembly repeated, then followed the prayer “Nos intres”, during which the brethren bowed low. The singers intoned the responsory “Qui Lazarum” and the assembly sang the continuation, while the prior swung the censer around the altar and the body. After the incensement a new series of prayers started with “Circumdederunt” and “Kyrie” as before. Then came the prayer “Deus qui omnia vivunt”, and while the responsory “Heu mihi” was sung, the altar and the body were again incensed. The third and last series of prayers again consisted of “Circumdederunt” and “Kyrie” followed by the prayer “Fac quaesumus Domine”, and the singers sang the responsory “Libera me, Domine, de morte” with the verse. “Creator omnium rerum deus”; (2) the assembly continued with “Dum veneris”, and finally the singers repeated “Libera me”. During this, the incensement was repeated. Here after the procession was formed again, and singing the antiphon “In paradisum” and the psalm “In exitu” it transported the deceased to the churchyard with lighted candles while the bells were ringing. The three-part »Creator omnium rerum deus« in Amiens 162 sets a widely circulated verse whose tenor tune can be found in the Worchester antiphoner; it is a prayer for the soul of the deceased on the day of judgment: “… facies in die iudicii resuscitari. Exaudi, exaudi. exaudi me ut animam meam in sinu Abrahe patriarche tui iubeas collocari ” (3) The words “Exaudi, exaudi, exaudi me” are set with fermatas on all notes to emphasize the personal address. Also the two-part »Quando deus filius virginis« is a prayer for grace on the day of judgement for the resurrected after the souls’ descends into the abyss. Its three stanzas each end refrain-like with the exclamations “O, O, O” with fermatas, followed by first hopefully “felix vox, felix promisso”, then worriedly “proth dolor, quanta tritistia”, and finally by a prayer to Jesus “Ihesu rex, exaudi poscimus preces nostras”. The setting ends with a clue for the repeat of the responsory by way of the musical and textual incipit of “Libera ...” in both voices in unison. The tune in the tenor and the text is found in a nearly identical version – with a clue for the repeat of the “Dum veneris”-section of the responsory after the second stanza – in a processionale/tropar from the second half of the 15th century copied in the Augustine monastery Grand-Saint-Bernard or in the Aosta Valley (MS Grand-Saint-Bernhard 7). Clemens Blume states that this regular poem of quite limited circulation probably is a reworking of the trope “Dicet iustis ad dexteram positis”, which first appeared in sources from the second part of the 15th century. (4) Surely, it is much younger than the text of »Creator omnium rerum«. The two multi-stanza songs in Amiens 162, “Bone Ihesu” and “Juxta corpus”, whose texts can be found in more or less contemporary polyphonic settings from other monasteries, expand the prayer to invoke the whole range of saints, from Jesus to holy men and women, for their assistance in saving the soul of the deceased from the jail of torments (“Bone Ihesu”, stanza 2). Their many stanzas are to be sung as verses in “Libera me” alternating with shortened repetenda of the responsory. (5) Hereby the responsory gains an impressive length and weight in the ceremonies. The strictly hierarchical order of the stanzas’ supplications is remarkably similar in their litany-like structure (see the table summarizing the texts). First the prayers in “Bone Ihesu” and “Juxta corpus” are directed towards Jesus, then to Maria, on to archangels, to John the Baptist, to patriarchs and apostles; in stanzas 5-6 we get to martyrs and male and female saints. In the second halves of the songs, saints from the later part of the middle ages begin to appear. The late saints combined with the different versions of the poems can help us to date and place this repertory. The Paris version mentions “bernardine” in the fourth line, while Amiens 162 emphasizes “benedicte”. One look at the pattern of rimes discloses that the Paris version must be the original wording of this stanza. It rimes, and St Bernardinus of Siena (1380-1444) who was canonized in 1450, rounds off nicely the stanza’s short enumeration of Franciscan saints, consisting of the founder of the order Francis of Assisi and Antonius of Padova. In stanza 7 the founder of the Order of the Poor Clares, St Clara of Assisi, is mentioned among the female saints along with St Elisabeth who was a Clarisse nun. St Bernardinus was a popular preacher who called for an ecstatic worship of the name of Jesus in his sermons. He was accused of heresy several times and was close to be excommunicated. At the same time he was an ardent reformer of the Franciscan Order and became in 1438 the first general vicar for the ‘observant’ or ‘spiritual’ branch of the order, which attached great importance to the duty of poverty and to preaching in the vernacular (Lexikon 1998, Bd. I, coll. 1973-75). In this respect he along with his contemporary Colette of Corbie (1381-1447) had a decisive influence on the Order of the Poor Clares and other orders of nuns affiliated the Franciscans. Figure 5, “Bone Ihesu dulcis cunctis”, stanza 6 (ff. 7v-8). All this makes it clear that Hand A had obtained »Bone Ihesu dulcis cunctis« in Franciscan circles in Paris. The poem was written in the second part of the 15th century, after the canonization of Bernardinus in 1450, and it must have been quite widely circulated, since it is found in Amiens 162 with a more ‘modern’ three-part music, different from the setting in Paris 10581. The simple two-part setting got, in return, a surprising afterlife, as its well-formed tenor tune resurfaced in the 19th century as the hymn “O come, 0 come, Emmanuel” (cf. the comments to the edition). The opening lines of »Juxta corpus spiritus stetit« quote the widely circulated dialogue from the 12th century, Visio Philiberti or Disputatio inter corpus et animam, which was used and reworked even in the 16th century, also in the vernacular. Here the soul and the deceased body quarrel about the responsibility for a wasted life. The soul cannot disclaim all blame, but both of them decline the main responsibility. The poem ends, when two demons take the soul to the torments of the damned. (8) In the stanzas 6-8 of the Amiens 162 setting saints are invoked, which belonged to the Dominican Order, Petrus Martyr (dead 1252, canonized 1253), Thomas Aquinas (dead 1274, canonized 1323), and Catherine of Siena (dead 1380, canonized 1461). Even if Catherina was intensely worshipped from shortly after her death, when prayers addressed to her caused miracles, this version of the poem probably was written after her canonization, later than 1461, because she is here ranked with St Anna, the mother of the Virgin Maria. This text was obviously acceptable at Corbie; the music of the stanzas has been carefully revised on the pages of the manuscript by Caulaincourt with the adjustment of the relationship between music and text as one of his objectives; see further ‘Notes on the reworked stanzas of »Juxta corpus spiritus stetit«’. In a Franciscan paper manuscript from the first part of the 16th century in Tübingen, Universitätsbibliothek, MS Mk 96, we find a two-part setting of the tenor tune in simple polyphony, which use five of the stanzas in a nearly identical version (stanzas 1-3 and 9-10). This setting appears in a revised version in a paper sequentiary/lectionary in Grand-Saint-Bernard, Bibliothèque de l’Hospice, Ms. 6 (1983), written around 1500 at the Augustinian monastery or in the Aosta Valley. 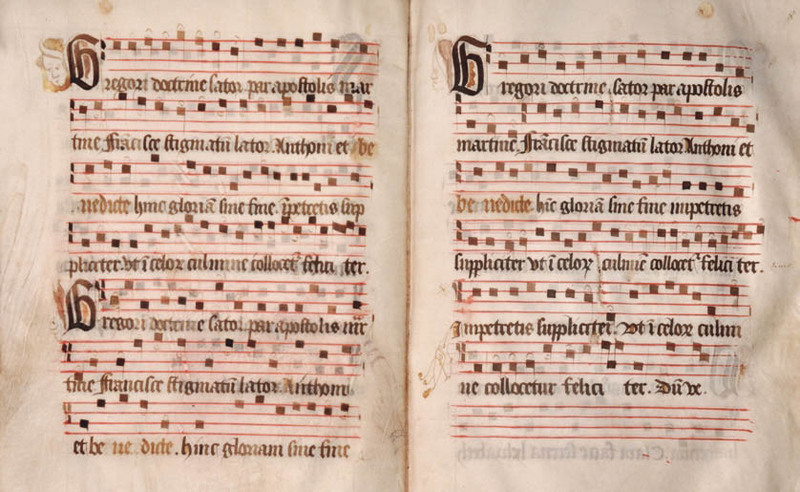 (9) Here the music shows a few changes, while the eight stanzas of text, corresponding to stanzas 1-6 and 8-9 in Amiens 162 display greater differences; they probably represent a revised version adapted to the Augustinian liturgy. In stanza 6, Petrus Martyr has been replaced by Triumphator Vincenti; and in the next stanza, Anna and Catherine of Siena have been replaced by Maria Magdalena and Catherine of Alexandria. In this way all the Dominican saints from the 13th-15th centuries have been replaced by Biblical saints or saints from the early centuries of Christianity. St Vincentus was martyred in 304, and Augustine wrote his Vita. The text in Grand-Saint-Bernhard 6 seems to have been revised during the copying process with greater attention to changing the names of saints than to its poetic structure. Several stanzas do not rime, and three stanzas (5-7) all end with the word “celorum” in complete disregard of the rime structure. This permits us to assume that this intercessory poem was created in circles of Dominican observance during the decades following 1461. Its text and tune apparently had appeal to monastic societies of other observances and became the starting point for new versions of the text as well as of the music. It seems striking that we for each of the three three-part compositions, which we have just looked at, can find related songs in contemporary sources, all set in simpler two-part polyphony. This indicates that Hand A was in fact able to deliver a specified repertory, which could live up to the highest demands imaginable for a collection of monastic music. He could offer – as we later shall discuss – a fullness of sound in music performable for untrained singers. 1) Ottosen 1993, pp. 213 ff, describes a repertory from Cambrai, where stanzas from the hymn “Ad consultum veritas” are sung to its own tune among verses of a different character. 2) The entire verse is entered with music in the Worchester antiphoner; all the preceding standard songs are represented by incipits only. Mocquereau 1925, planches 438- 39. 3) Knud Ottosen has found the versus in 465 sources after the 11th century – in 461 instances as a versus for “Libera me”, cf. Ottosen 1993, p. 405, V38. The verse appears also in books of hours copied in the second half of the 15th century, cf. for example Horæ ad usum Sarum (The Bohun Hours), Copenhagen, The Royal Library, MS Thott 547 4°, f. 59, or The Burnet Psalter, Aberdeen University Library, MS 25, f. 277r-v.
4) Blume 1906, pp. 383-84; Knud Ottosen has found the stanzas 14, 5 and 4 times respectively as verses for “Libera me” in sources from the second half of the 15th century and later; cf. Ottosen 1994, pp. 410 ff, V173, V261 and V108. In an office from the Benedictine monastery in Tiron (near Chartres) the verses appear in the same order as in Amiens 162 and Grand-Saint-Bernard, Ms. 7 (ibid. p. 250). 5) “Bone Ihesu” has clues for the repeats of the responsory sections (after stanzas 2 and 7 repeats from “Quando celi”, and after stanza 6 from “Dum veneris”), and for the final repeat of the complete responsory. “Juxta corpus” in Amiens 162 does not include references to “Libera me”. However, the two-part setting of the same tune and text in MS Grand-Saint-Bernard 6, pp. 208-223, has elaborate clues for the repeats of the responsory; see further the edition. 6) Exactly the same selection of contents, including the two-part “Bone Jesu dulcis cinctis”, can be found in a contemporary French processional in the Honnold/Mudd Library, Claremont Colleges, MS Crispin 14 (cf. Dutschke 1986, pp. 32-33, and Fenner 2014), and in a similar book in Philadelphia, Free Library, Collection John F. Lewis, MS E 180, dated 1603 (cf. RISM BXIV/2, pp. 494-495). These small books were probably produced by Clarisse nuns in many copies after closely related exemplars during a period beginning in the late 15th century. 7) Nicolette Boillet (Colette of Corbie, 1381-1447) had grown up at the Corbie Abbey and had received her education from the Benedictines. Between her 21st and 25th year she chose to let herself be confined in a small cell in the apse of the church Saint-Étienne in the abbey. During these years of reclusion she had visions of St Franciscus, which induced her to work for the foundation of monasteries of the Poor Clares – later called Colettine (or Coletan) houses – primarily in the Burgundian lands. She founded 17 female monasteries with the support of the Burgundian duke. In 1440s, with Corbie under Burgundian rule, she tried again in 1445 to create at a Clarisse nunnery in Corbie – her first attempt in the 1420s had failed. Her project had the support of the duke, of the French crown, the abbot of the monastery and of the pope, but it failed because of the fierce resistance from the monks, cf. Amiens MS 524 D pp. 307-312, Gaillard 1963, pp. 325-26, and Warren 2005, pp. 15-20. On Colette of Corbie, see further Campbell 2014 and Lopez 2000. 8) Cf. Lexikon 1998, Bd. VIII, coll. 1733, Art. ‘Visio Philibert’, and coll. 235ff, Art. ‘Streitgedicht’. 9) Both settings are published in Amiens 162 Edition no. 5 Appendices. 10) In the later stanzas of the poem (not set in Amiens 162) the prayer concerns the soul on the day of judgement, “In tremendo dei iudico” and “Dies illa, dies terribilis”, with invocations of Maria as helper. The similarity of expression to the sequence “Stabat mater dolorosa” (in Amiens 162 ff. 30v-35) has been pointed out, cf. Szövérffy 1964, vol. II, p. 289. Even more striking is the kinship of these stanzas with the verses “Dies irae” etc. in the responsory ”Libera me” and with the renowned sequence of the requiem mass. 11) The MSS Amiens 162, Grand-Saint-Bernard 7 and Tübingen 76. 12) Lyon, Bibliothèque de la Ville, ms. 6632 fonds musicales, and Uppsala, Universitetsbiblioteket, Musik i Handskrift 76a, cf. Christoffersen 1994, vol. I, pp. 319-327. Concerning the Lyon fragments, see further Shand 2007. The four compositions are published in the Amiens 162 Edition no. 2 Appendices.